Powerful new unit from Sensaphone! Makes a great replacement for the 4100 or Express! 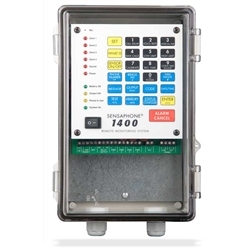 The Sensaphone Model 1400 is the perfect solution for your 4-channel remote monitoring needs. It combines all the feature of the popular Sensaphone 1100 desktop series, but adds significant enhancements that expand your monitoring and notification capabilities. These include custom voice message programming, rechargeable battery backup, extended battery backup, and extended temperature sensing. The 1400 is packaged in a sealed, lockable NEMA-4X enclosure to withstand harsher environments. Please see the detailed features described below.